A few months ago Discernment Ministries received a special request from a longtime supporter and active discerner. She was invited to teach a woman's Sunday School class in her local church and was in the process of seeking permission from her pastor to talk on the subject of discernment. While she was in discussions with her pastor, she e-mailed us wondering if we could recommend a teaching series on discernment. She wanted something that would address the basics: how to discern, what to discern, the biblical nature of exercising discernment, etc. We realized there really wasn't anything available that we could recommend. Several of us headed out to Pastor Bosch's church, Sun Valley Community in the Los Angeles area, to spend a few days filming Anton's 7-part teaching series on exercising discernment. Pastor Rod Page volunteered to put together a useful Study Guide to accompany the teachings with an outline and questions for further study. 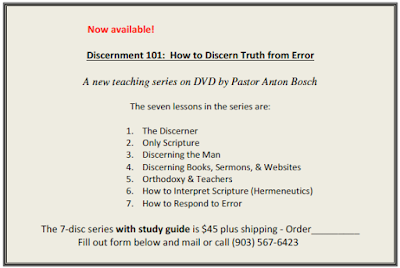 You will find the Discernment 101 teachings a suitable study series for Sunday School, mid-week or Sunday night services, Bible studies, home groups, or your own private study. Print out the handy form below to follow the instructions to order. is $45.00 plus $5.00 shipping. 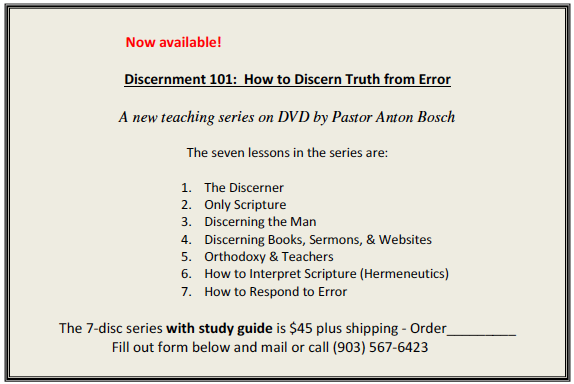 We pray that the Discernment 101 teaching series will be a blessing and encouragement to all of you. This book focuses on the rise of a new prophecy eschatology in the evangelical church world that looks NOT for "that blessed hope, and the glorious appearing of the great God and our Saviour Jesus Christ." 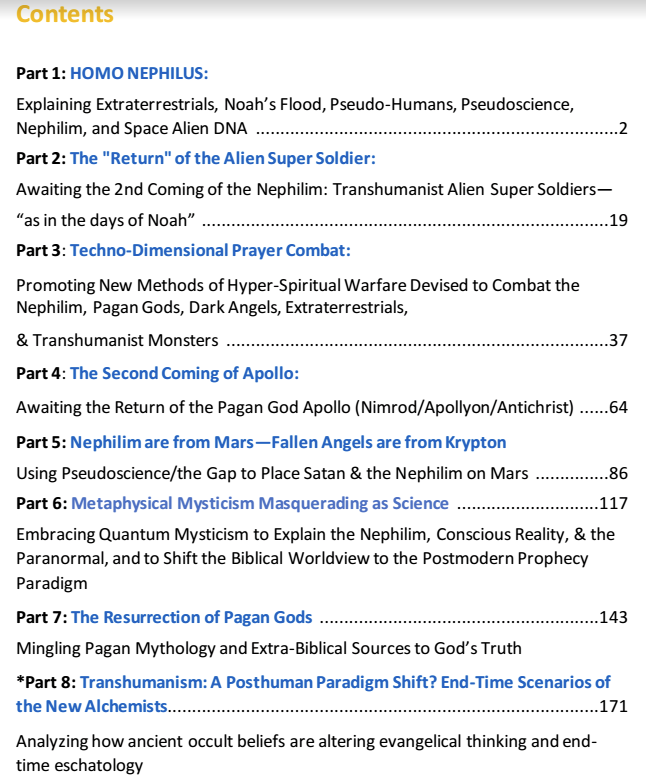 Many endtime prophecy teachers are switching their focus to an anticipated cosmic invasion of monstrous space alien creatures which some teach Christians must battle using spiritual warfare technologies. Many evangelicals are now believing in these dramatic endtime invasion conspiracy scenarios which are accompanied by salacious imagery and sensational hype. But is all of this biblical? For further research, see our post Spiritual Seduction and follow the many links at the bottom. This online e-book continues our new project to begin posting our many lengthy article series online as downloadable free e-booklets. Prayers and support would be much appreciated. See our previous online E-booklet: Mainstreaming The Mystic 'Force' . From Broad Way Billy . 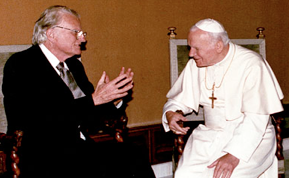 . .
Just as Pope John Paul II was the catalyst for the current ecumenical movement, evangelist Billy Graham was the inspiration behind many leading evangelical leaders flocking to Rome today in ecumenical solidarity. Hall is intentionally crossing ministry and denominational lines, calling on Christ followers to come together to reach the next generation. The Billy Graham Evangelistic Association (BGEA) is one of several ministries partnering with RESET, which Hall says resembles the early days of Youth for Christ—a ministry that was born in the 1940s, with Billy Graham as its first full-time evangelist. But Hall’s “generation-defining” movement called RESET is a false gospel, (see Part 1), that is leading multitudes onto the Broad Way apostasy bridge and away from the saving Gospel of the Lord Jesus Christ. The televangelists are among some wealthier U.S. evangelicals who have recently met with Francis, who has called for a focus on the poor and a simple lifestyle for clergy. In March, the pope met with members of the Green family, the Oklahoma billionaires whose company, Hobby Lobby, won their challenge to President Obama's contraception coverage mandate at the Supreme Court last week…. 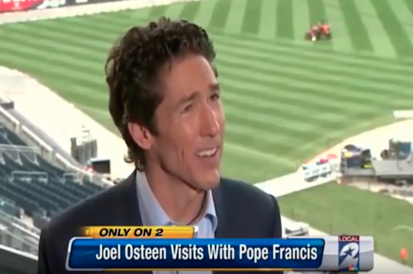 [Joel] Osteen's meeting with Francis on June 4 was part of a larger gathering coordinated by the International Foundation, also known as "the Fellowship." Osteen was joined by Utah Sen. Mike Lee, a Mormon; California pastor Tim Timmons; and Gayle D. Beebe, president of evangelical Westmont College. But the Lord Jesus said to beware of false teachers pointing to the broad way that leads to destruction for many (Matt. 7:13). Instead, He taught His sheep to enter through the narrow doorway of the Cross. Even a casual observer to these recent Vatican visits can see that this wayward cast of shepherds hosted by the Roman Pontiff hold to various strands of aberrant doctrines—erroneous teachings that even compete with Roman Catholic dogma. On what basis could all of these so-called Christian leaders unify? Certainly not upon the Word of God or the Lord Jesus Christ it proclaims. Take heed therefore unto yourselves, and to all the flock, over the which the Holy Ghost hath made you overseers, to feed the church of God, which he hath purchased with his own blood. For I know this, that after my departing shall grievous wolves enter in among you, not sparing the flock. Nick Hall, the young catalyst behind the Reset/Together 2016 movement and eager apprentice of Billy Graham, also met with Pope Francis in 2013. 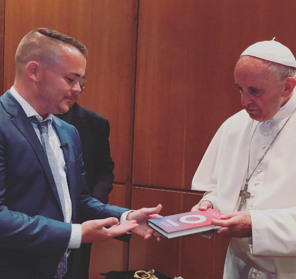 He presented the Pope with a copy of his book, Reset. Although the Pope was not directly involved with the OneThing Catholic Ecumenical Track event in 2015, the youth gathering demonstrates the concerted push for unification from all streams of Christianity, including the New Apostolic Reformation (NAR). Husband and wife team Iwona and Keith Major started a nonprofit called MajorChange, a Catholic ecumenical organization, that now collaborates with Mike Bickle’s International House of Prayer (IHOP) in Kansas City. Francis Chan was the event’s keynote speaker last year. Chan was also a featured speaker at Nick Hall’s Together 2016 event in July. OneThing 2015 Catholic Ecumenical Track on YouTube. There is no sign that the feud between the two men has been resolved, but among Trump’s cache of spiritual advisors include Broad Way-ers James Robison and Kenneth Copeland. Will they will counsel the POTUS candidate toward reconciliation with the Pontiff in the weeks leading up to the election in November? But these reckless and insensitive sentiments not only betray the import of John 17, they also betray our Christian brethren who perished for the sake of the Gospel. No one can be justly sanctified by Christ or truly unified with Him by aligning themselves with enemies of His Gospel, His Word, or His Body. The Scriptures tell us that the Lord God remembers those killed for His sake, even if men posing as God’s workmen like Robison do not. The Harlot Church, “drunken with the blood of the saints and with the blood of the martyrs,” will one day give an account to Him for her abominations against God (Rev. 16:5-7; 17:3-6, 15-18; 18:4-8, 20; 19:1-2). The Bible also warns us that this ‘Whore of Babylon’ will be led by a religious global leader—a False Prophet—in cahoots with the Antichrist (Rev. 13:11-17; 16:13; 19:19-20; 20:10). God’s Word tells us that this unholy trinity, led by Satan (the Dragon), will ravage and attempt to destroy God’s Bride before Jesus Christ returns to the earth (Dan. 7:19-26; Rev. 12:17; 13:1-8; 16:6; 17:6; 18:24). Are we in fact witnessing the coalescing of the Harlot Church in this hour shortly preceding a day of inordinate tribulation on earth? Is persecution looming on the horizon for the faithful remnant—those who refuse to unify with apostasy? James Robison and Nick Hall were among a popular cast of evangelical and NAR leaders, pastors, teachers, and authors who came together for a National Solemn Assembly September 21st in Dallas, called The Gathering, “to unite the Body of Christ in America– all believers, regardless of race, age, or denomination – in prayer for forgiveness, wisdom, and provision for our nation.” Anne Graham Lotz, the undiscerning daughter of ecumenical evangelist Billy Graham, was among the many scheduled speakers. There is urgent need for an ecumenism that, along with theological dialogue aimed at settling traditional doctrinal disagreements between Christians, can promote a shared mission of evangelization and service…. In order to unify all religions—and indeed the world—the Pope must first unify those identifying themselves as Christian under his authority. As a political and governmental leader with religious power, it is imperative that the Roman Pontiff succeed in his ecumenical and interfaith endeavors in order to secure global religious control and ultimately cross completely over the apostate Broad Way Unity Bridge. 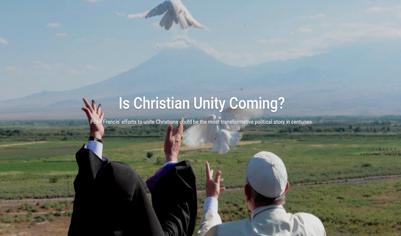 Is Christian Unity Coming through Pope Francis? Those of us involved with foreign policy, national security and international relations tend to focus most of our attention on the immediate threat or short-term trend. Some of us involved more on the military or diplomatic wing rarely look at religion, except for the contemporary focus on jihadism emanating out of the Islamic world. Lost in this is the planetary view that attempts to identify titanic, or potential shifts, in world politics. On Sunday, Pope Francis attended the Divine Liturgy celebrated by the patriarch at Etchmiadzin, the center of the Armenian Apostolic Church. He reiterated his much used word, "scandal," to describe Christian disunity. Much has been written about Pope Francis' attempts at reform, his possible views on immigration, climate change and economics. However, far above all of this are indications that this pope has a renewed interest in Christian unity. Those who watch and study this know all too well that we have seen this before, and it came to naught. However, there are signs to indicate that we may be witnessing a more fundamental desire…. Some have reported that a meeting and declaration like this has not happened since 1054 AD…. While Colucci is correct to say that the Pope’s ambitious plan to unify Christians would potentially be a “titanic shift in world politics,” biblically, his conclusions are tragically wrong. When—not if—Christendom unifies in this way, it will not be “an unstoppable force for good,” but a deadly vehicle for the Antichrist. In his article, Colucci also briefly mentioned Pope Francis’ public apologies to “various protestant groups for sins committed against them.” These recent apologies will also facilitate bridge-building in order to “leave the old ways behind” (in the words of James Robison), and push on toward global unification. The next historic gathering to this end for Pope Francis will be a Joint Ecumenical Commemoration of the Reformation on Oct. 31st in Lund, Sweden. A Broad Way 2nd Reformation? The Lutheran World Federation and the Catholic Church will hold a joint ecumenical commemoration of the Reformation on 31 October 2016 [Halloween, ed.] in Lund and Malmö, Sweden. It will begin with a liturgy in Lund Cathedral and continue with a public event in Malmö Arena that will be open to wider participation. 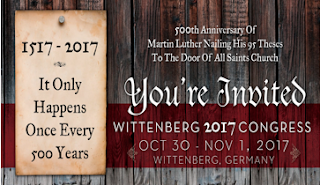 The Wittenberg 2017 Summit, scheduled to be held at the Castle Church in Berlin next year, will include Christian luminaries such as Leonard Sweet (Emergent), George Wood (Assemblies of God), and Samuel Rodriquez (New Apostolic Reformation) cited above. James O. Davis, founder of the Billion Soul Network, which is sponsoring the event, will also be a presenter. A Broad Way Reinvented (“Reset” of) Luther?! On October 31, 2017, the 500th anniversary of the Protestant Reformation, it is possible that Pope Francis might publicly apologize on behalf of his murderous Roman Catholic predecessors for the brutal atrocities committed against the martyred Christian Reformers (who suffered and died for the sake of the Gospel of Christ). But if he does this, it is likely he will do so without completely repenting of his false Gospel, false Christ, and the multitude of other false doctrines taught in his church. Will he posture global unity while affirming the title “Vicar of Christ”? This appears to be the Pope’s modus operandi. By treacherously striving to undo (“reset”) the Reformation with feigned confession, counterfeit doctrinal transformation, and false promises for enduring global harmony the Pope, with his Broad Way ecumenical evangelical associates, may precipitate the greatest falling away from the truth the world has ever known (Lk. 18:8; 2 Thess. 2:3; 1 Tim. 4:1). If we truly love the lost souls about us, no matter what their religious affiliations, we will increase our efforts to bring them the truth of the gospel before it is forever too late. Such was the passion of Bishop Hugh Latimer, England’s most powerful preacher in his day. He had dared to explain the errors of transubstantiation and of Rome’s false gospel even during the reign of Henry VIII, for which he was imprisoned in the Tower of London. Released when Edward came to power, Latimer continued his passionate preaching of the gospel of salvation by grace through faith in the finished work of Christ until, under Bloody Mary, he was imprisoned again and burned at Balliol college on October 16, 1555. Be of courage, Master Ridley, and play the man. We shall this day, by God’s grace, light such a candle in England as I trust will ever be put out! Such is the heritage of today’s Protestants, which evangelical leaders are now dishonoring and even repudiating. Christian leaders who likely would not have known the gospel but for the martyrs who bravely stood up to Rome are now joining in an unholy partnership with that very institution which shed the martyr’s blood! 1. Graphic exhibit taken from Carol Brooks, “Billy Graham,” In Plain Site website; see: http://www.inplainsite.org/html/billy_graham.html. 2. 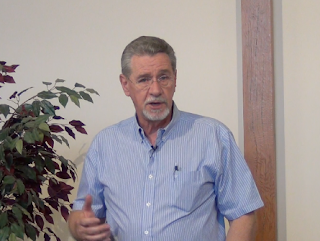 David Cloud, “When Did Graham's Compromise Begin?” Fundamental Baptist Information Service, Port Huron, MI, Updated December 5 2013 (first published August 5, 2008). The following was first published in the out-of-print book Evangelicals and Rome in 1999; see: http://www.wayoflife.org/database/grahamcompromise.html. Bold added. 3. Robert M. Zins, Th.M., On the Edge of Apostasy: The Evangelical Romance with Rome, White Horse Publications, Huntsville, AL, 1998, pg. 241. 4. Ibid. Zins, pg. 241. 5. Graphic exhibit taken from Lance Goodall, “Together 2016 – Nick Hall Meets Pope Francis – Revisited,” Coercion Code website; see: https://coercioncode.com/2016/06/18/together-2016-nick-hall-meets-pope-francis-revisited/. 6. 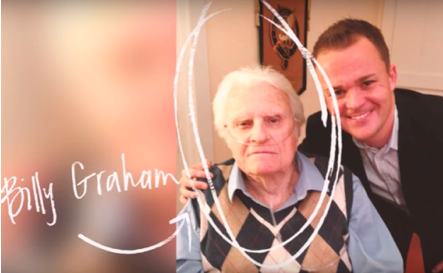 Kevin Porter, “'Billy Graham of the Next Generation' Calls on 1 Million Americans to Unite in Prayer in Washington This Summer,” Christian Post online, March 28, 2016; see: http://www.christianpost.com/news/evangelist-nick-hall-together-2016-1-million-americans-unite-prayer-washington-160270/. 7. See Nick Hall’s Together 2016 “Commissioning” video on YouTube: https://www.youtube.com/watch?v=KB6wqfpMahE. 8. See Wikipedia “Explo ‘72”; see: https://en.wikipedia.org/wiki/Explo_%2772. 9. Kristy Etheridge “RESET Movement Calls Next Generation to Go ‘All In’ for Jesus,” Billy Graham Evangelistic Association online (BGEA), October 22, 2013; see: https://billygraham.org/story/reset-movement-calls-next-generation-to-go-all-in-for-jesus/. 10. Exhibit is screenshot from YouTube video: https://www.youtube.com/watch?v=49ItTjxe0ZQ. 11. CBS News, “The Positivity of Joel Osteen,” March 27, 2016; see: http://www.cbsnews.com/news/the-positivity-of-joel-osteen/. 12. James Robison Life Today website, “Pope Francis on Life Today”, May 2, 2014; see: http://www.jamesrobison.net/pope-francis/. 13. Ken Silva, “Arrogance and Blasphemy: The Faith of Kenneth Copeland,” Apprising Ministries, Sept. 6, 2008; see: http://apprising.org/2008/09/06/arrogance-and-blasphemy-the-faith-of-kenneth-copeland-2/. 14. Ed Tarkowski, THE LAUGHING PHENOMENA: Its History and Possible Effects on the Church Part 1, Deception in the Church; see: http://www.deceptioninthechurch.com/Laugh1.html. 15. See Bill Randles’ book, Weighed and Found Wanting, (1995), documenting the so-called Toronto Blessing/Holy Laughter movement and leader, John Arnott; see: http://web.archive.org/web/20040703040810/http://www.geocities.com/Bob_Hunter/1.htm. 16. 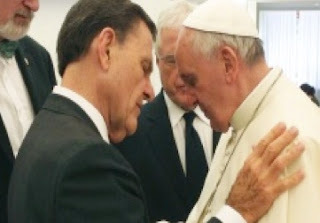 Sarah Pulliam Bailey, “Pope Francis Meets With Kenneth Copeland, James Robison—High Fives Ensue,” Charisma News online, July 10, 2014; see: http://www.charismanews.com/world/44601-pope-francis-meets-with-kenneth-copeland-james-robison-high-fives-ensue. 17. 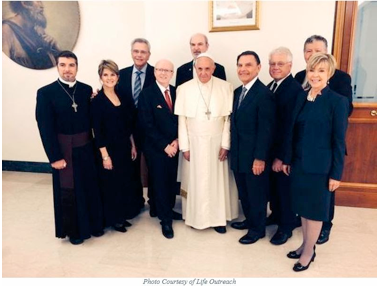 Kathy Schiffer, “Joel Osteen Attends Mass in St. Peter’s Square, Meets With Holy Father,” Patheos website, June 7, 2014; see: http://www.patheos.com/blogs/kathyschiffer/2014/06/joel-osteen-attends-mass-in-st-peters-square-meets-with-holy-father/. 18. Graphic exhibit taken from Kenneth Copeland Ministries, “Kenneth Copeland Visits the Pope, June 2014,” KCM; see: http://www.kcm.org/slide/kenneth-copeland-visits-the-pope-june-2014. 19. Graphic taken from Waterbrook/Multnomah website, Nick Hall’s book, Reset; see: http://waterbrookmultnomah.com/books/536780/reset-by-nick-hall-foreword-by-josh-mcdowell-luis-palau-and-ravi-zacharias/. 20. Robert Barbry II, “Ecumenism In Action: An Interview with Iwona Bednarz-Major,” Epic Pew, Feb. 4, 2016; see: http://epicpew.com/ecumenism-in-action/. 21. See Major Change website: http://majorchange.org/onething/#catholic-track. 22. 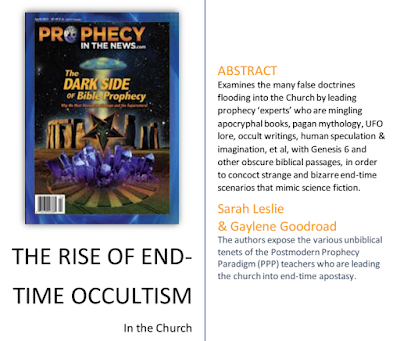 For background on Mike Bickle’s Latter Rain cult teachings, ‘The Passion and the Presence,’: “Bridal Eschatology Part 3,” Herescope, March 08, 2014; see: http://herescope.blogspot.com/2014/03/bridal-eschatology.html. 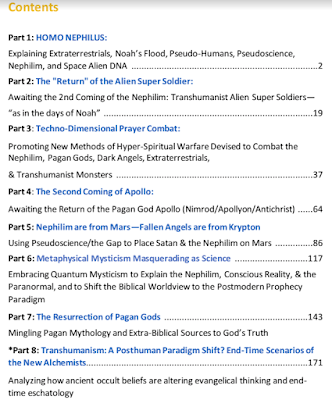 Note this is a 6 part series, a comprehensive overview of the old Latter Rain cult doctrines found in this youth movement. 23. 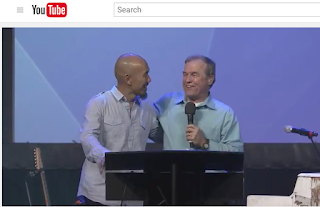 For Chan’s unbiblical connection to Bickel see: Ken Silva, “Francis Chan Declares ‘I love Mike Bickel’ of IHOP”, Apprising Ministries, Jan. 2, 2014; see: http://apprising.org/2014/01/02/francis-chan-declares-i-love-mike-bickle-of-ihop/. 24. See Chan’s website: http://crazylove.org/events. 25. Graphic exhibit taken from the MajorChange video on YouTube: http://majorchange.org/onething/. 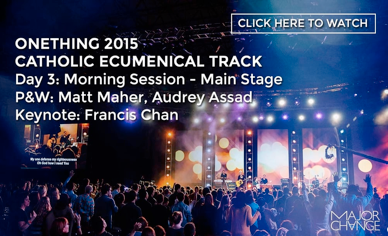 Also, see the OneThing 2015 Catholic Ecumenical Track video on YouTube: https://www.youtube.com/watch?v=-2muxxpAc-8&feature=youtu.be. 26. Ben Schrenkinger, “Trump calls for Christian unity at Liberty U.,” Politico, Jan. 18, 2016; see: http://www.politico.com/story/2016/01/trump-liberty-university-217942. 27. Hayley Hoefer, “Views You Can Use: The Pope Vs. the Donald,” US News and World Report, Feb. 18, 2016; see: http://www.usnews.com/opinion/articles/2016-02-18/pope-francis-says-donald-trumps-views-on-immigration-arent-christian. 28. Ben Jacobs, “Donald Trump calls Pope Francis 'disgraceful' for questioning his faith,” The Guardian, Feb. 18 2016; see: https://www.theguardian.com/us-news/2016/feb/18/donald-trump-pope-francis-christian-wall-mexico-border. 29. “Full text: Donald Trump responds to Pope Francis,” Politico, Feb. 18, 2016; see: http://www.politico.com/story/2016/02/full-text-donald-trump-responds-to-pope-francis-219435. 30. See Dan Scavino’s Twitter page: https://twitter.com/DanScavino/status/700368610322206720?ref_src=twsrc%5Etfw. 31. Kate Shellnutt and Sarah Eekhoff Zylstra, “Who’s Who of Trump’s ‘Tremendous’ Faith Advisers,” Christianity Today, June 22, 2016; see: http://www.christianitytoday.com/ct/2016/june-web-only/whos-who-of-trumps-tremendous-faith-advisors.html?start=1. 32. James Robison, “Witnessing the Miracle Jesus Prayed For,” James Robison website, June 26, 2014; see: http://www.jamesrobison.net/witnessing-the-miracle-jesus-prayed-for/. 33. James Robison, “Witnessing the Miracle Jesus Prayed For,” James Robison website, comments section, Sept. 18, 2014; see: http://www.jamesrobison.net/witnessing-the-miracle-jesus-prayed-for/. 34. Graphic exhibit taken from Parables website, Oct. 7, 2014; see: http://parablesblog.blogspot.com/2014/10/tony-palmer-and-covenant-of-blood.html. 35. 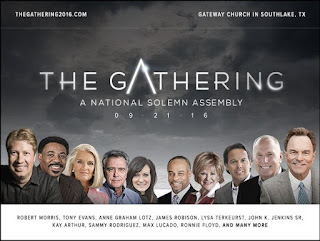 See: http://thegathering2016.com/national-solemn-assembly/ and https://www.youtube.com/watch?v=ljR6pOifHoY. 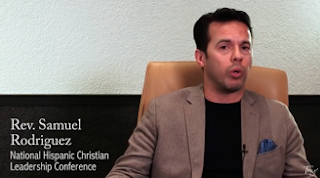 See Part 1 of this series for a background on Pastor Rodriguez: http://herescope.blogspot.com/2016/07/resetting-reformation.html. 36. 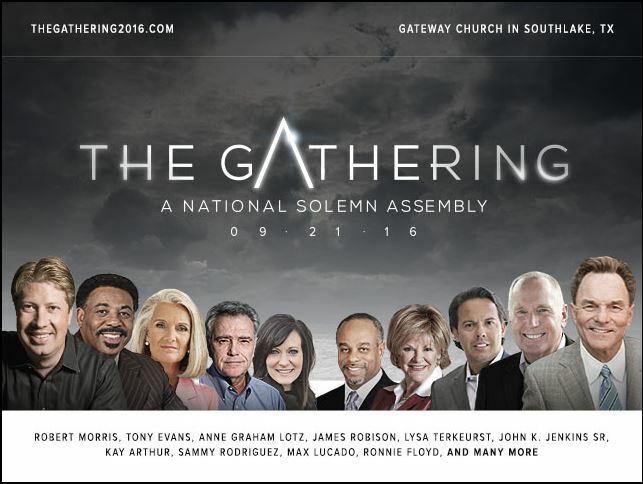 See The Gathering website: http://thegathering2016.com/speakers/. 37. See The Gathering website, “About”; see: http://thegathering2016.com/about/. 38. For further background on Anne Graham Lotz’ unbiblical teachings see: Marsha West, “LOTZ of nonsense,” Berean Research , April 18, 2016; see: http://bereanresearch.org/lotz-of-nonsense/. 39. 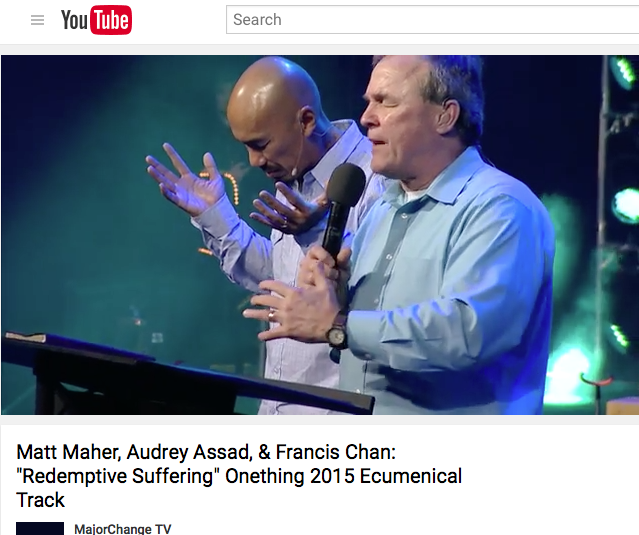 See The Gathering website, “Our Partners”; see: http://thegathering2016.com/our-partners/. 40. See the UN I nternational Day of Peace website: http://internationaldayofpeace.org/. 41. Graphic exhibit taken from The Gathering video on YouTube: https://www.youtube.com/watch?v=yeKeZVdwQWY. 42. Graphic exhibit taken from the UN International Day of Peace website: http://internationaldayofpeace.org/. 43. Ines San Martin, “Francis if proving to be a very ecumenical Pope,” Crux, Jan. 25, 2016; see: https://cruxnow.com/church/2016/01/25/francis-proving-to-be-a-very-ecumenical-pope/. 44. Zenit, “Pope’s Address to World Communion of Reformed Churches,” June 10, 2016 (translated from Spanish); see: https://zenit.org/articles/popes-address-to-world-communion-of-reformed-churches/. 46. New World Encyclopedia online, “Papal States”; see: http://www.newworldencyclopedia.org/entry/Papal_States. 47. See Wikipedia, “Papal Supremacy”: https://en.wikipedia.org/wiki/Papal_supremacy. 48. Rebecca Terrell, “Pope's Environmental Encyclical Calls for World Government,” The New American, June 19, 2015; see: http://www.thenewamerican.com/world-news/item/21092-pope-s-environmental-encyclical-calls-for-world-government. 49. Graphic exhibit taken from US News website: http://www.usnews.com/opinion/articles/2016-06-28/could-pope-francis-bring-about-christian-unity. 50. Lamont Colucci, Is Christian Unity Coming?” U.S. News & Report online, June 28, 2016; see: http://www.usnews.com/opinion/articles/2016-06-28/could-pope-francis-bring-about-christian-unity. 51. Reuters, “Why Pope Francis Just Asked Protestants for Forgiveness,” Newsweek online, Jan. 25, 2016; see: http://www.newsweek.com/pope-francis-protestants-forgiveness-persecution-419512. This theology of repenting for the sins of one's ancestors is called Identificational Repentance. 52. Ibid. Ines San Martin, Crux: https://cruxnow.com/church/2016/01/25/francis-proving-to-be-a-very-ecumenical-pope/. 53. Graphic exhibit taken from Lund, Sweden website: http://www.lund2016.net/. 54. Graphic exhibit taken from the Luther 2017 website: http://luther2017.tv/. Be sure to notice Leonard Sweet's leadership in this endeavor. 55. See the Joint Ecumenical Commemoration website: http://www.lund2016.net/. 56. Graphic exhibit taken from the ‘Together Europe’ video trailer: https://www.youtube.com/watch?v=0CyLm0Nrkko. 57. See Martin Luther bio, Biography.com: http://www.biography.com/people/martin-luther-9389283. 58. See the ‘Together for Europe’ website/video: http://www.together4europe.org/en/. 59. Vatican Radio, “Pope Francis: video message to Together for Europe 2016”; see: http://en.radiovaticana.va/news/2016/07/02/pope_francis_video_message_to_together_for_europe_2016/1241550. 60. “Ecumenical Congress promoted ‘unity’ between Catholics, Protestants and Evangelicals,” Evangelical Focus, July 4, 2016; see: http://evangelicalfocus.com/europe/1757/Ecumenical_congress_in_Munich_promoted_unity_between_Catholic_Orthodox_Protestant_and_Evangelicals. 61. For more information on Leonard Sweet, see the new Lighthouse Trails booklet by Warren B. Smith, “Leonard Sweet – A More Magnificent Way of Seeing Christ?”; see: http://www.lighthousetrailsresearch.com/blog/?p=21371. 62. Ibid. Luther 2017: http://luther2017.tv/. 63. See Davis’ website: http://www.jamesodavis.com/new/meet-james/. To see the dominionist connections between such men and Sweet and Davis, see the 2010 Herescope article, “Mainstreaming Dominionism”: http://herescope.blogspot.com/2010/05/mainstreaming-dominionism.html and the 2012 article, “Ca$h Cow$ & Fat Cat$ - the Cult of Evangelical Leadership, Part 2”: http://herescope.blogspot.com/2012/10/cah-cow-fat-cat.html. 64. Ibid. 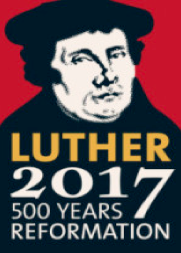 Luther 2017: http://luther2017.tv/. 65. Dictionary.com, “Vicar of Christ”; see: http://www.dictionary.com/browse/vicar-of-christ. 66. Dave Hunt, A Woman Rides the Beast, Harvest House Publishers, Eugene, OR, 1994, pp. 409-410. 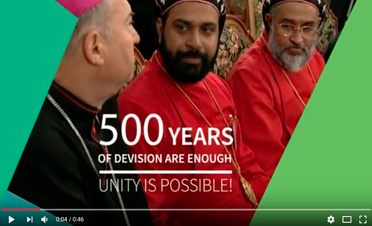 *Pope's derisive comment regarding the Reformation, made “Ecumenical Congress promoted ‘unity’ between Catholics, Protestants and Evangelicals,” Evangelical Focus, July 4, 2016; see: http://evangelicalfocus.com/europe/1757/Ecumenical_congress_in_Munich_promoted_unity_between_Catholic_Orthodox_Protestant_and_Evangelicals.